I will show you how to properly blend social media into your business strategies so that you successfully grow your business and strengthen your team through Facebook, Instagram, YouTube, and other online platforms. Why Social Media? Why Now? Social Media is where most of the population hangs out. It’s time to bridge the gap between online and offline and make a difference for you and the Network Marketing Industry. Everybody is branding themselves, but not everybody has a personal brand. Your Internet Presence in Social Media speaks to who you are and the audience you’re reaching. Learn the steps to building your own brand. In this module you are going to learn how to expand your brand and start to attract your friends, followers and fans (the 3F’s). In the 4th module you will learn how to best convert your network of friends, followers and fans into prospects… And do it in a way that is duplicatable for your team. My goal is that you never run out of people to talk to. Now the step comes where you need to convert your prospects into customers and distributors.. People ask me all the time, should I focus on Customer or Distributors…and the answer is BOTH. But they STAY for the opportunity. Once they become a fan of the product and begin to make you connections, it opens their imagination to the opportunities. In Module 6 you will learn how to train and communicate with your team. There are 2 sides to this, the public side and the private side. The person who is most connected with their organization wins. The person who is able to communicate best with the organization wins. The time to start is now! Network Marketing without duplication is a job. We don’t want the Network Marketing experience to be just that… a job, over a long period of time. In this module you will learn key principles for duplication in your Network Marketing Business. 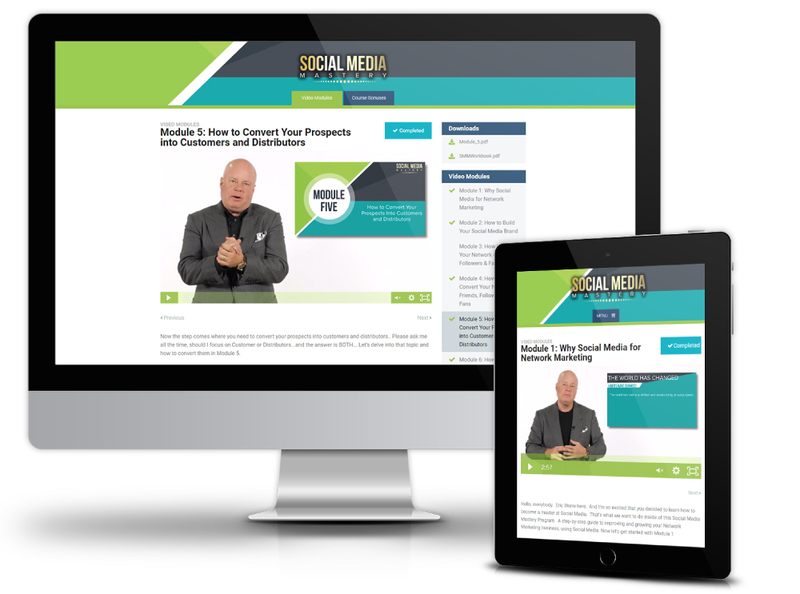 In these bonus video modules, I will review the top social media platforms, strategies for using video, simple technology tips for maximizing platforms, and the Do’s and Don’ts of expanding your brand from top experts! With these bonus worksheets and PDF workbook I will teach you how to build your profile, attract followers, convert followers into prospects, convert prospects into customers and distributors, and train your team all with social media! You will be able to follow along, do the video exercises, and jot down new ideas. You will have instant access to full PDF transcripts of each video module (including bonus video modules) so you can follow along or take with you on the go.